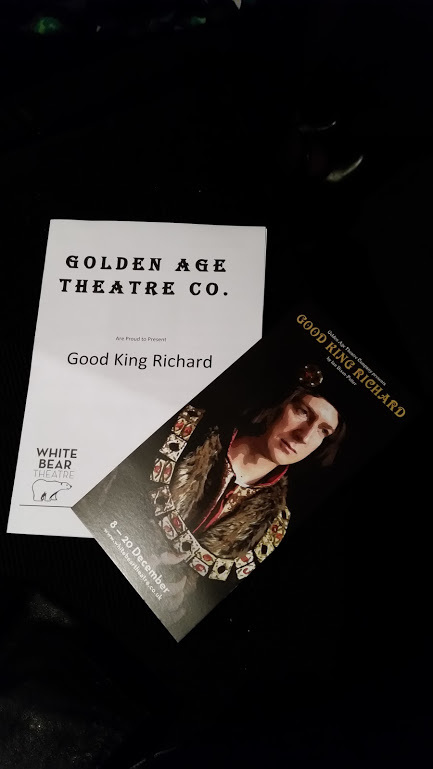 Programmes for ‘Good King Richard’. Photo by Medievalists.net. Richard the Good? We’re not talking about Richard the Lionheart here, we’re talking about Richard III (1452-1485), the medieval celebrity king who was finally laid to rest in March of this year, amid much controversy and fanfare. Richard III has often been portrayed as a villain, thanks to the Tudor propaganda churned out after his death to vilify him. In addition to that, William Shakespeare’s play, Richard III, written in 1592, depicted a sinister, rapacious, and murderous hunchback king. The play claims to present a vision of the king that is “unsullied by Tudor propaganda”. That may well be the case, and they certainly succeeded in putting Richard in a good light, but perhaps the pendulum has swung too far the other way? The play opens with the murder of George Plantagenet, the Duke of Clarence (1449-1478), brother of Edward IV (1442-1483) and Richard III (then, Duke of Gloucester). The duke is drowned in a vat of Malmsey wine (as the rumours say), and Richard is enraged by this egregious disregard for family by his brother Edward IV. He is determined to get to the bottom of Clarence’s death and severely reprimands Edward for allowing himself to be influenced by the machinations of his wife, Elizabeth Woodville (1437-1492). This is contrary to Shakespeare’s version of events where Richard speedily expedites the execution of his brother, and is the one who actually frames him for treason against Edward. Nicholas Koy Santillo as Richard III. Photo by The Golden Age Theatre Company. Throughout the play, Richard III is depicted as the man who is trying to thwart the plots and devious schemes of Elizabeth Woodville and Margaret Beaufort (1443-1509), mother of Henry Tudor (1457-1509). The two women are determined to usurp Richard, and his good intentions for the realm. While trying to set things right, and uncover the lies woven by the Woodvilles, he is betrayed by his closest friend and ally, Henry Stafford, the Duke of Buckingham (1455-1453) played by Ben Harper. The duke is related by three of his grandparents to Edward III and the play depicts ambition getting the better of him as he eventually joins forces with Elizabeth Woodville to try to claim the throne. His claim to the throne is as legitimate, if not more so, than Henry Tudor’s. Unfortunately, his treachery is discovered and Richard condemns his friend to death for treason. He uncovers the bigamous marriage of his brother and Elizabeth, and announces her her children illegitimate. Richard then takes the crown and things begin to spiral downward for him. The play is a small affair. It was held at the White Bear Theatre, a tiny London playhouse in the back of a pub. It has one stage and very little in terms of props, but that’s where the strength of the story lies: in the acting. Nicholas Koy-Santillo plays Richard, and manages to pull off a highly convincing “good guy” version of the infamous king. His delivery is believable and his stage presence was engrossing. Peter Collington does a stand up job and the easily manipulated Edward IV, and Albert Clack and Will Mytum do some great switch ups by playing two very different characters – northern guards, narrating and explaining the action to the audience, and then as nobility, as Henry Tudor and Bishop Morton (1420-1500). The remaining performances were good supporting roles but by far, the strongest character was Catherine Dunne’s Elizabeth Woodville. Her performance were reminiscent of Lady Macbeth, i.e., she was very good at being beguiling and sinister. Zara banks did a solid job as the scheming Margaret Beaufort, but at times she came off as a bit over the top. Catherine Dunne as Elizabeth Woodwille talking to Hastings played by John McLear. The costumes and the few props that were used leave much to be desired (think more like a high school play budget), but good acting doesn’t require much to transport you and make the story interesting. While I’m not keen on the wildly revisionist storyline, I really enjoyed the performances and I can, at the very least, respect the attempt to tell the other side of Richard’s story. Interesting to note: Richard is not played as a hunchback in this show. In his opening monologue, Richard initially comes out on stage hunched over, and hobbling. He then stands up straight and speaks directly to the audience that this is what people want to believe about him – that he was a deformed monster. By refusing to play Richard in that way, it’s a refutation of Tudor rumour and the Shakespearen depiction of a monstrous hunchback. Another note: it’s a very in depth look at the history of the period – for those unfamiliar with the War of the Roses, or Richard III’s reign, this was a crash course in late fifteenth century English history and politics You have to pay attention, it’s very heavy on dialogue due to it being a small budget affair, so they can’t rely on props, grand costumes and stage sets to help tell the story. Albert Clack and Will Mytum try to mitigate some of the confusion with their simpleton soldier characters narrating what’s going on and why, but it’s still a bit heavy on detail. While the play is good, it certainly doesn’t present a balanced view of Richard III. It paints him as a moral do-gooder, the victim of the plots and rumours from ambitious relations and grasping courtiers. That’s only part of the story. Richard may have been vilified by eager Tudor historians but he was certainly no saint. Given the high calibrate of the acting, I would’ve preferred a more balanced approach to Richard’s rule. It seems most plays about this monarch are content to go either full blown Machiavellian evil, or too far into the “reforming Richard” camp. This play falls into that latter trap but it was still impressive for being able to do so much on such a small scale. After seeing this, I’d like to see someone tackle Richard’s problematic rule onstage in a more balanced fashion.